What is CHORIOMON and what is it used for? In order to prevent problems of ovulation(anovulation) and combined with other drugs for the development of follicles in cases such as menstruation or irregular menstruation (amenorrhea), CHORIOMON is given to provide the ovulation. CHORIOMON is used to mature these ovums after treatment with other medicines in order to produce ovum with other medicines. It is used in the treatment of patients with little or no sexual glands, delayed puberty or problems related to sperm formation. Always apply CHORIOMON in the amount specified by your doctor and exactly as described. If in doubt, consult your doctor or pharmacist. CHORIOMON will usually be administered by your doctor or appropriately trained personnel. If the medicine is to be prepared by you and administered subcutaneously, please make sure that you have received sufficient information from your doctor. The dose of your drug will be determined by your doctor according to the results of the tests performed before and after the treatment. 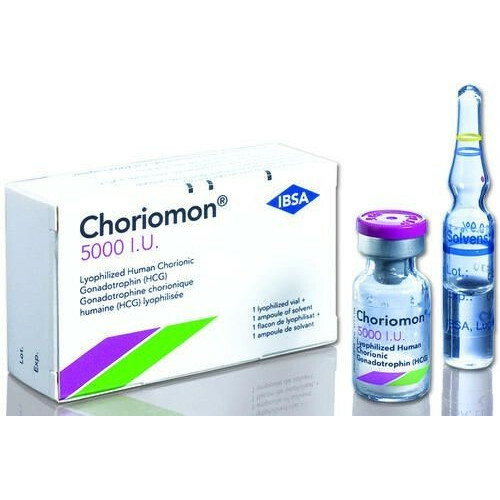 CHORIOMON should be applied subcutaneously or intramuscularly. It should not be applied into vein. CHORIOMON should not be taken orally. The first application should be performed under the supervision of your doctor. Your doctor will describe in detail how to use your medicine for further applications. The solution for injection is obtained by dissolving the powder in the vial by means of the solvent contained in the cardboard box. The prepared solution should be used immediately without waiting. Remove the aluminum seal of the vial containing CHORIOMON and clean the rubber stopper with alcohol cotton. 2- Take the syringe containing the solvent. Insert the needle into the vial through the rubber stopper and slowly inject the entire solvent (and some air) into the vial. Wait until the powder in the vial has completely dissolved. 3. After the powder is dissolved (usually the powder is immediately soluble), turn the vial upside down when the needle is still inside, pull the needle slowly back until the tip of the needle is close to the surface of the rubber stopper (ie the bottom of the vial which is turned upside down). Slowly pull the solution from the vial into the syringe. Make sure you get the whole solution. Take off the needle from the syringe and leave it in the vial to prevent it from sinking. Insert a new needle (subcutaneous type) into the syringe. Hold the syringe upright with the needle tip up and gently tap the syringe to allow air bubbles to accumulate on top. Gently push the plunger to expel air bubbles. When the solution drop appears at the tip of the needle, the air in question will be thrown. Adjust the amount of CHORIOMON in the syringe as instructed by your doctor. Your doctor or medical team should have provided you with information about where you can inject CHORIOMON (eg, abdomen, thighs). Wipe the selected area for injection with alcohol cotton. Pinch the skin with your fingertips and immerse the needle in the skin you clamp at a 45-90 degree angle. Inject all of the solution in the syringe by pushing the piston slowly. Quickly pull back the needle and wipe the injection site with alcohol. Do not rub the injection site, otherwise bruising may occur at the injection site. Overexpression in prepubertal children may lead to serious consequences that may lead to premature puberty and endure growth. Therefore, it should be used with caution in children. CHORIOMON is not used in the elderly. Talk to your doctor or pharmacist if you have an impression that the CHORIOMON effect is too strong or too weak. 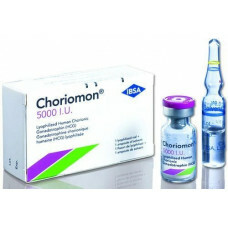 If you have used more than you should use CHORIOMON, talk to a doctor or pharmacist. Contact your doctor if you forget to use CHORIOMON. Like all medicines, CHORIOMON may have side effects in people who are sensitive to the substances contained in its contents. • Fry, itching, face, lip, hand / standing swelling, shortness of breath, faint state, high fever. In such a case, you may be allergic to CHORIOMON. • Thromboembolism (gasp as a result of cloging in the vein). This may occur especially when hMG or FSH hormones are used together. These are all very serious side effects. If you have one of them, you may need emergency medical care or hospitalization. All these very serious side effects are rare. If your ovaries show excessive arousal during your treatment. The first signs of overexcitation of your ovaries are abdominal pain and nausea, vomiting, diarrhea and weight gain. All these are serious side effects. Emergency medical intervention may be required. If any of the conditions listed above is available, do not use CHORIOMON and tell your doctor before use.